Looking for a fun holiday craft project you can do with the kids? 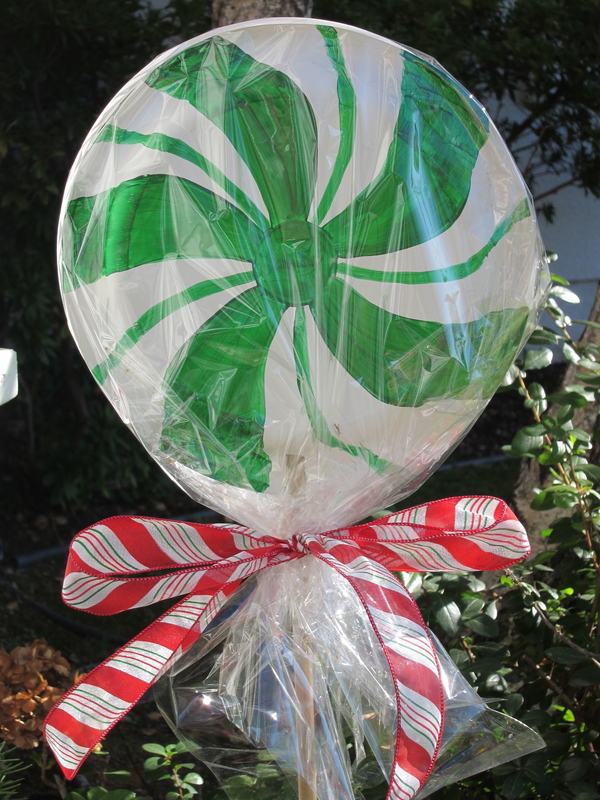 These lollipop yard stakes go together in an afternoon. And, the kids can do so much of the project themselves (actually all of the project, if they are pre-teen or older). Natalie and I painted the paperplates in traditional mint candy fashion (plus one with polka dots). We actually painted them last year, but never got around to finishing them until this year. The nice thing about this holiday craft is that they are easy to store — and take up very little space if you unassemble them before packing them away. 1. Paint the backs of the paper plates with your desired design. Remember to paint two plates for each lollipop. We painted our designs in pairs, so each lollipop would look the same on both sides. 2. Once the paint has dried, you cut a notch in each paper plate the width of the wood dowl. When the plates are glued together, this will create a hole for the dowl. 3. Glue the paperplates together (facing each other, with the painted design on the outside). Be sure to align the notches to make the hole for the dowl. Once glue is dry/hardened, insert wood dowl in notched hole. 4. Cut a sheet of cellophane about 24 by 24 inches. You may need to adjust the size if your plates are larger or smaller. Place the cellophane over the two plates that are glued together and gather it together at the bottom so that the end of the dowel sticks out. 5. Tie the cellophane with a ribbon where it is gathered, making a bow. 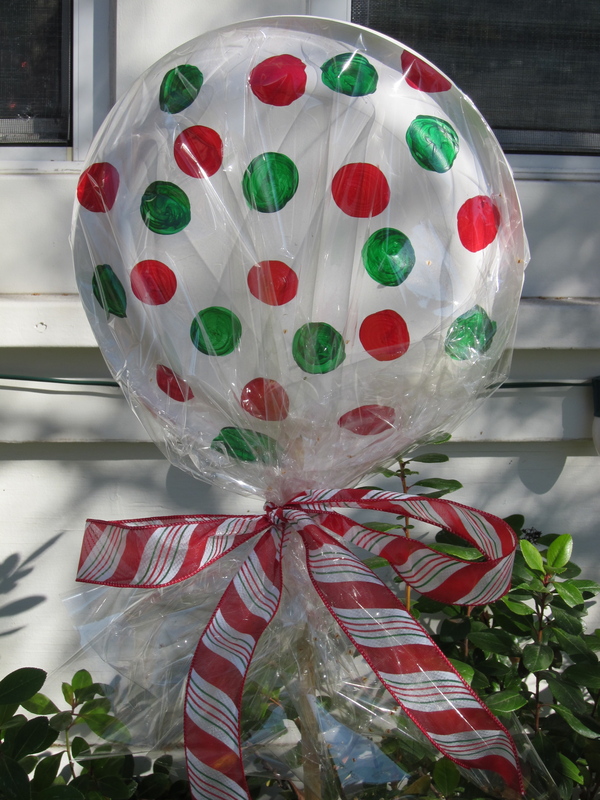 Lollipops can be used in your yard, in potted plants, in planters … or like Natalie — she has one in her bedroom. Very cute! How do these hold up in rain and snow? They have held up in light rain. Living in So Cal they haven’t been put to the test with big rain storms and certainly not snow. If you make sure to seal the cellophane sides (or use extra wide cellophane sheets), you should have better results in wet weather. Looks like fun w kids. I’m doing it! I LOVE THIS IDEA. THANK YOU SO MUCH FOR SHARING. Love it! I also saw this done with colored cellophane with no painting. So cute! SOOOOO cute! 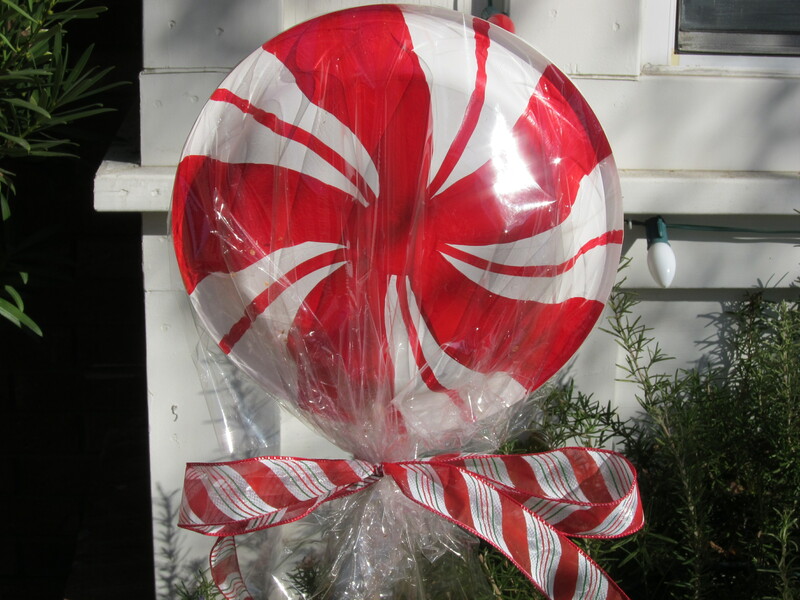 They would also be cute if cellophane was wrapped and tied on both ends – then figure out a way to suspend the “wrapped candies” from a deck, or overhang. My home’s livingroom overhangs the the downstairs family room, and I hang plants from hooks there in the summer. I’ve been looking for ideas to hang from those same hooks for the holidays. This idea, along with large “Christmas ball ornaments”, has my mind swirling with possibilities! They would be cute as wrapped candies! Have fun decorating for the holidays.